MuscleGro contains a blend of high quality amino acids and primary proteins for the production and protection of muscle in horses. Our unique formulation is balanced for performance. See and feel the results knowing your horse is receiving the high quality ingredients formulated to develop muscle growth naturally. Benefits horses in every discipline. Why Would I Use MuscleGro? Whenever you feel your horse could improve their topline or are young and underdeveloped. 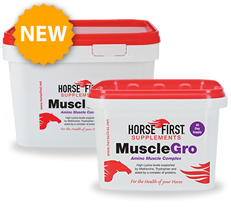 MuscleGro can be fed to all types of horses in every discipline to improve their muscle development. Loading: Add one 25g scoop to the morning and evening feed.